Capital rugby starlet Ben Robbins believes a spell playing in New Zealand has helped him become a better all-round player – and now he is looking to really kick on in the coming months. Robbins, who turns 19 on Friday, travelled to Christchurch with another Edinburgh youngster, Callum Hunter-Hill, on the Macphail Scholarship during the summer. The two teenagers immersed themselves in the rugby culture in New Zealand, played for local club sides and were given access to top-level coaching. Robbins has played winger for most of his career with George Watson’s College, Watsonians and the Scotland age-grade teams but, with the High School Old Boys in New Zealand, he also got a run out at full-back. And he feels that getting game time under his belt in a new environment and in the No.15 jersey has helped him grow as a player. “I loved my time in New Zealand and it was great for me just to be thinking about rugby all of the time,” Robbins said. “Last season was my first out of school, but I missed a lot of rugby due to injury, so to head to New Zealand and be able to play quite a lot of games was just what I needed at this stage in my career. I learned a lot about getting more involved in games and getting my hands on the ball while, from full-back, I saw the game a bit differently and started to work well with my wingers. Now back in Scotland, Robbins is working hard with the other members of the BT Sport Scottish Rugby Academy based at Napier University’s Sighthill campus and now turns out for Currie in the BT Premiership. He said: “Last season, being based at BT Murrayfield and aligned to Edinburgh Rugby was great, but now being up at Sighthill has allowed myself and the other young players to work hard together day in and day out and really make even further strides. I am loving working with head coach Ben Cairns at Currie and we have a lot of young backs who have played for the Scotland under-20 team in recent seasons so we enjoy playing with each other. Robbins is edging back to full fitness now, though, and has his sights set on turning out for the Edinburgh-based Academy team against the Glasgow and the West Academy team in the final of the under-20s Regional Championship at BT Murrayfield on Sunday. “With the under-20s Six Nations extended squad likely to be selected in the next few weeks we will all be looking to impress those watching and knowing a lot of the boys from Glasgow it is set to be an entertaining and competitive match,” Robbins said. BT Cup holders Boroughmuir will launch their defence of the trophy with a tie at home to Hawick – the side they beat in last season’s final – when the second-round matches take place on January 30. 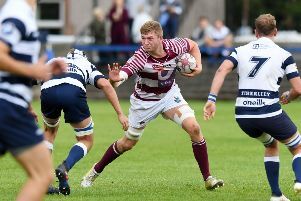 Yesterday’s draw threw up another attractive proposition in the form of a Capital derby between Watsonians and Stewart’s Melville at Myreside. BT National Division One outfits Musselburgh and Edinburgh Accies have the chance to test themselves against BT Premiership opponents when Grant Talac takes his Burgh side to face Selkirk, while Accies welcome another top-flight team, Stirling County, to Raeburn Place. Elsewhere, Division Two side Preston Lodge also face higher-rated opponents when they play host to Jedforest. RHC Cougars will have home advantage against Dumfries Saints. Six of the ten BT Premiership sides featured in yesterday’s ballot, with the top four finishers in last season’s league, including Heriot’s and Currie, handed byes into the last 16. The draw for the second round of the women’s tournament, the Sarah Beaney Cup, paired Broughton with Glasgow University, while Watsonians will travel to play Howe of Fife.